Yan ang nakita ko sa Erap.ph matapos pumutok ang balita ng pagbibigay ni Pangulong Gloria ng absolute pardon kay Erap. Aba, Ginang Gloria napupuno ka ng grasya. Ang kayamanan ng tao ay sumaiyo na. at pinagpala naman ang iyong anak na si Mikey. Ngayon at baka mamaya ay magkaisa ang bayan at paalisin ka na. Although justice may be tempered with mercy, mercy itself was not meant to substitute for justice. The President cannot pardon a person who makes no admission of guilt; no expression of contrition; and no offer of full restitution. Only the truly repentant deserves an once of mercy. The result of a presidential grant of absolute pardon at this time would be an act of injustice to all Filipinos. Parang narinig ko na yang sinabi ni Bunye sa The Buzz at Showbiz Central ah. showbiz nga! walang kwentang gobyerno! Yes ayos na Brod Ederic! Dami ko na nabasa sa maghapon about Erap n GMA. Wala na bang iba? I am strongly against President Macapagal Arroyo’s granting of executive clemency to a convicted plunderer like former President Estrada because till now he doesn’t admit to his sin. But there’s nothing we can do anymore. We should rather pray for Mr. Estrada’s spiritual, physical, mental health and well-being, for his spiritual conversion, for his return to the Truth, and for the sanctification and salvation of his soul. The Estrada pardon confirms that then Vice-President Macapagal Arroyo joined the public clamour for then President Estrada’s resignation not for patriotic reasons but because she was ambitious. di ba ang pardon dapat binibigay sa taong tumatanggap at umamin ng pagkakamali at may pangakong magbabago? 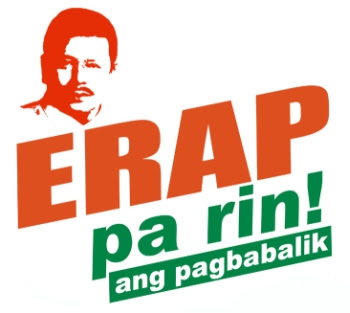 Si Erap hanggang ngayon, kahit convicted plunderer sya, dine-deny na nagnakaw sya sa bayan. Nasaan ang repentance? HA?! ?